Tag Archives for " Christoph Schachner "
Marketing is not about you selling your product but about you satisfying the needs of your customer. This can be done in various ways but with proximity marketing, you have the advantage of providing your customer with what he wants in the right context. A recent survey shows that 7 out of 10 smartphone owners use their smartphone before and during shopping for better purchase decisions. Business owners and marketers have taken notice of that but only very few provide shoppers with recommendations and offers during the whole shopping experience. By the end of this post, you will know how to create your own proximity marketing solution to make your marketing campaigns even more effective. 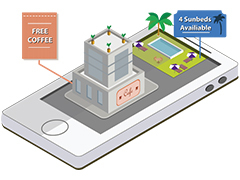 Location-based campaigns are all about adding real value to visitors and customers. You don’t want to flood smartphone owners with messages but to send them highly personalized notifications. For this, you need the following four essentials. With the broad distribution of smartphones, the first essential is usually in every pocket. However, not all buyers have turned on Bluetooth so make sure to encourage them to do so through appropriate and visual information. Don’t worry – LE stands for low energy, Bluetooth nowadays consumes much less energy than it used to. There are two kinds of beacons, the small Bluetooth LE emitters: iBeacons according to Apple’s specification and Eddystones from Google. The iBeacon broadcasts three IDs (UUID, major and minor ID) in certain intervals and at a defined power. However, it does this in a rather clever way: a smartphone can not only receive the signal but also measure its strength. Hence, it can calculate the distance to the iBeacon. Eddystones broadcast a URL that certain mobile browsers like Google Chrome or Opera can open – at least theoretically since the technology is far from being ready for primetime. The last key component is a mobile app. iBeacons can only work along with an app. It can send notifications to the consumer while getting into the reach of an iBeacon. A recent example for a gamification use-case of BLE beacons is Heineken. Note: Todays customers don’t just install any app. You need to make your apps value clear in order to get it installed. Too many notifications or the inability to turn them off will result in higher uninstallation numbers. 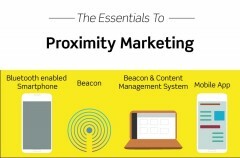 Now that we got the basics set up, it is time to think about how to implement your own proximity marketing strategies. No one likes spam emails, right (except for this guy maybe)? The same is true for sending notifications to smartphone owners. Those notifications shouldn’t be pushed to their limits but you should focus on the circumstances and the current needs of the customer. The rule of thumb is one notification per customer (e.g. entering a supermarket). Keep the messages simple, entertaining, helpful and be a companion – not a seller. Proximity marketing depends heavily on the content you provide. The channel requires you to deliver content that is specific to time and location. Determining what your customers are looking for and how they feel during their shopping process requires a profound understanding of your brand, products or your service. Only if you precisely know who you enable to serve your customers perfectly. Running location-based campaigns consists of creating unique and engaging content, installing the hardware (e.g. rolling out the beacons) and analyzing the ROI. All those tasks demand different skills but with the right software, you can make your life easier by combining the distinct tasks into one hub. Location-based campaigns can add value to already existing campaigns but also create customers completely new marketing approaches. iBeacon technology lets you connect directly with you customer. You can recommend products that fit your customers’ needs or show them ads about the product that they have recently looked at. With access to lifetime analytics you get insights on consumer behavior and can combine mobile statistics with other metrics to improve your sales strategy. Signs are no longer static displays but come to live and deliver dynamic and interactive experiences on the sign and on the customer’s smartphone. 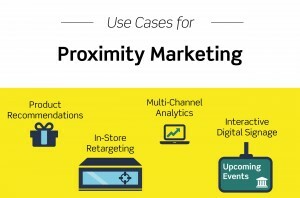 Before reading this post you might have asked yourself: What is proximity marketing? Now you should be able to identify how you can benefit from this technology and include it in your marketing plans. Keep the aspects you have learned in this post in mind and reach your goals faster, whether it is driving sales, loyalty or brand awareness and bring your mobile marketing campaigns to the next level. Christoph Schachner is a growth hacker at the Austrian startup xamoom.com, a provider of a location cms for proximity marketing. Christoph loves anything related to marketing, EDM, and memes.